sist very nearly of a series of simple harmonic vibrations. 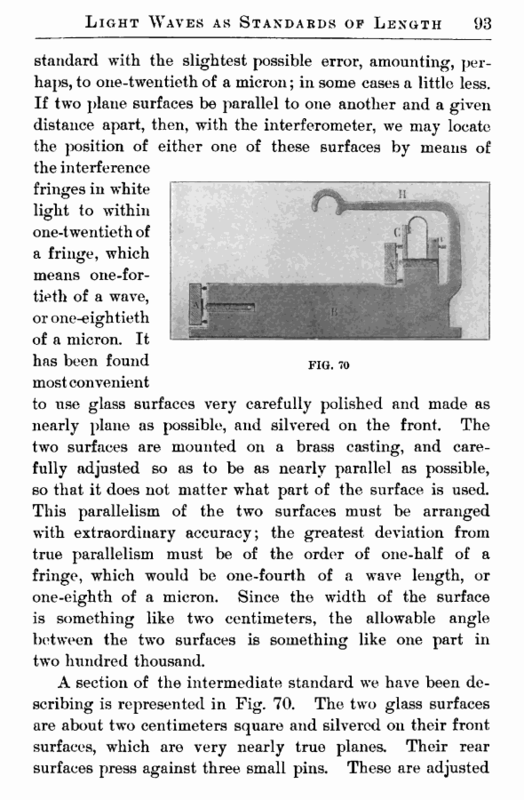 This radiation was therefore eminently suited to the purpose, and was adopted as the standard wave length. Most substances produce a more or less complicated spectrum involving quite a number of lines, but in the case of cadmium vapor, though there are three different radiations, these three are all so nearly homogeneous that each one can be used; and the complexity of the spectrum is in this case an advantage, as will be shown below. To produce the cadmium radiation, metallic cadmium is placed in a glass tube which contains two aluminum electrodes. The tube is then connected by glass tubing with an air pump and exhausted of air. The tube is also.heated so as to drive off all residual gas and vapor, and when the required degree of exhaustion is reached, it is hermetically sealed and in condition to use. The cadmium is not very volatile, and at ordinary temperatures we should see scarcely anything of the cadmium light when the electric discharge passes. The tube is therefore placed in a metal box, as shown in Fig. GO, which is furnished with a window of mica and has a thermometer introduced into one side. 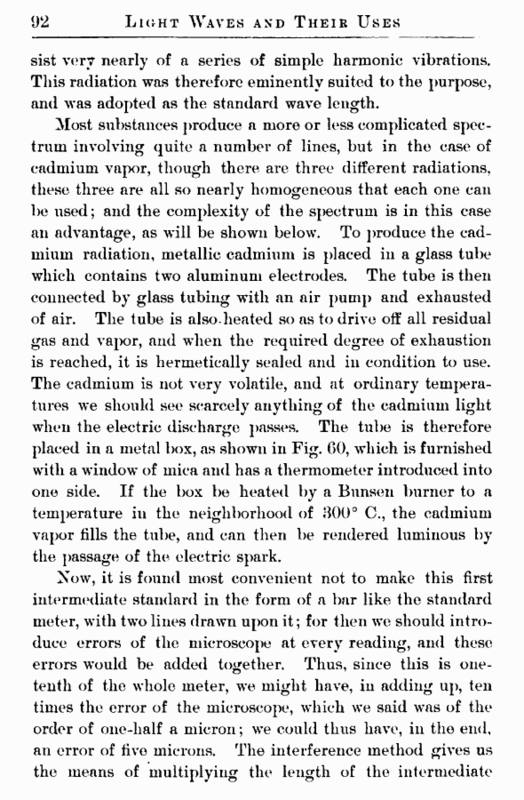 If the box be heated by a Bunsen burner to a temperature in the neighborhood of 300° C., the cadmium vapor fills the tube, and can then be rendered luminous by the passage of the electric spark.